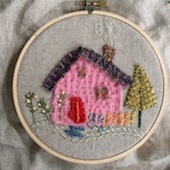 Over the weekend, I'm going to practice some new stitches including that woven stitch in the birdhouse there. It's true that sometimes in advance of a teaching gig, I start to grumble about the prep and schlep, the struggle to muscle all my stuff into bags, out the door, through the airport, through another airport, a hotel and then into the classroom. But after that, it is so fantastic. Watching each group of students assemble, reveal their personalities as they work, share the best of themselves with old and new friends, teach each other and me, create masterworks from my kernel of inspiration. It is a privilege to be there. At The Creative Connection, I taught two classes twice and each time felt as if the project became something unique to the group of students. The Book Bag was a challenging construction process at times, but they all turned out so darling. I do think many will make these for friends and holiday gifts. The Home is Here Banner class was lovely- relaxed and easy-going like old-fashioned sewing circles where we talked about parenting, social and craft issues as we cut, collaged and stitched. In the last class, two students were eleven-year-old best friends, Hannah and Taylor, passionate crafters with an Etsy shop. Inquisitive and inspired, they were eager to learn a few new fancy embroidery stitches. These girls have Big Plans. It was an honor to be part of the weekend's teaching event and thank you, thank you to all the talented, adventurous and sweet students who took my classes. It fills me up again and always makes me happy to be able to do what I love - and then share it. Life is good. Before that old house of ours was pink, it was blue. I'm working this favorite for the second time and making it feel all new again with some different colors and stitches. We had a busy-to-lazy weekend here. A new birdfeeder was installed for my birthday. Within 10 minutes, the chickadees claimed it as their own. Today it's a flutter with so many excited little birds included the tufted titmouse. I took my mom out for some much-needed fun and then spent a lazy Sunday stitching, watching football and baseball inside a full house. We were treated to a feast of Mexican foods prepared by John Paul's beautiful mother, Mariluz. While he was home in Chicago last week, she packed an entire cooler full of love for us. Salpicon served on tostadas and pambazos filled with chorizo and potatoes. All so delicious! I loved watching Erin prepare and finish these regional dishes with the skills and flair that Mariluz has lovingly taught her. She's mastering the traditions with her own tomatillo sauce! On my list for this week in the studio is prep for Quilt Market, now just a month away! Just behind that is my next teaching event at Mary's studio in Saint Louis, November 12 and 13 (Mary Engelbreit's Home Companion Workshops). Still spots available for one or both days. Funny how the calendar kind of mashes up around a few big dates and the months start to feel like passing cars. Time flies and all that. Another reason to visit Mary's site is to sign a petition of sorts to bring back the Home Companion magazine! Wouldn't that be wonderful? Mary's got a plan .... but she needs the votes. If you have a second, stop by and add your name to the growing list. Power in numbers. Pass it on or as Mary would say, Shout it from the rooftops! Just like that, summer swept by. But what a memorable last night of summer for us! For Erin's birthday, I scored tickets for Wilco online moments after they went on sale months ago. John Paul is visiting his folks back home, so I got the extra ticket and went with Erin, Maggie and James. The air was thick with humidity (but no rain!) and excitement as we made our way a few blocks up 5th Avenue to Central Park's Rumsey Field. (Bergdorf Goodman's fall windows!) There's something about that stretch of pavement that always generates wonder and happiness for me. The soaring sycamores, triple wide cobblestone path, the zoo tucked inside the park wall and the old-world buildings on the east side of the street. The glow of the Plaza at night is from a fairytale. And then, there we were. Inside the park, following the rising music and suddenly standing in a gentle audience of Wilco fans. Singing, swaying, so happy - grateful for every song, story and encore. It was everything. When it was over, we walked back through the park once more, now part of a mellow but brisk crowd. Erin took my hand, in the way that a mother minds her little one. When she let go, Maggie gave me a little "stay close" hug and did the same. Seriously sweet. Folks went their various ways as the evening welcomed wanderers. We admired all the quiet streetscapes and glistening scenes that show themselves in the dark without the daytime bustlers and even explored the lobbies of the Plaza - just because we could. Seeing us home with flickering lights giving way to riverside trees, the Hudson led the way north, quietly scattering the last lovely pieces of summer to the past. We have friends with a new baby, a baby sister for their adorable Charlotte. While I was musing aloud about what to make for her birth present, Maggie suggested I think about something that would be fun for both of them, something to cherish beyond the baby years. When Maggie and Erin were little I made a bunny hutch with bunnies inside a fabric cottage. She remembers it as so much fun to carry around and play with. She thought a little farm would be a good idea. So here it is, Maggie's Farm :: a stitchable tote bag with eight little farm animals inside. I designed and made it with you in mind too. The PDF is over in my shop now. Inside the barn tote, there is a horse (which could also be a donkey), a cow, a sheep, a pig, a duck, a rabbit, a rooster and a hen with two chicks. All finished up. So sweet! I'm sending it off today though I'll be sorry to see it go. Yes, it's pretty much fun to play with. Today is my late father's birthday, just after mine. He taught us to love the country, farms, their animals and creative play. Our own farmgirl, Maggie's clever idea came straight from those long ago lessons. Dad would like this. Very much. Home again from a fantastic and fast-paced weekend teaching and connecting in St.Paul at The Creative Connection. I loved, loved my classes and students! Writing a blogpost that would do it justice would take me a week of days, but I will come back to it later. It was everything and more that one could have imagined. Like most people there, I came away richly inspired and challenged - and so very grateful for this abundance of genuinely creative colleagues, friends and students. Running from classes to panels to meetings, there's almost nothing in my camera so I'm going to send you here to watch Janine's lovely slideshow. She captured the scene perfectly. As promised, my intention is to finish up Maggie's Farm today. While my head is still spinning, a little stitching might settle things down a bit. So much to think about! John Paul's aunt embroidered this tablecloth set in the 50's. Erin brought it out so I could admire the work- so beautifully done. This is my favorite section, those colors in the flowers are so gorgeous and carefully stitched. Have a lovely September weekend! Have you seen this book yet? I have a copy here because I was invited to contribute a project. My lampshade is featured inside this amazing collection of makeable projects using old books. It's beautifully done and I'm thrilled for Lisa, her team and all the project designers. There's an ounce of room left in my bag and I'm taking my copy along with me to The Creative Connection. One of my classes repurposes an old book into a clutch handbag and if everyone finishes in time, maybe some students will be inspired to try a project from Lisa's book as well. Plenty of inspiration here! After all these years of birthdays away, I'm making pancakes for you this morning right here at home! Hip, hip! Happy, happy birthday, dear Erin! I tried to have breakfast in my studio this morning, but there wasn't a place to put the plate down. I'm a little overwhelmed with half-finished projects and stacks. This week will be about preparing to go to St.Paul/Minneapolis for The Creative Connection. I still have Etsy orders to get out, class kits to wrap, another fabric collection to finalize and ship, a magazine assignment nearly there. In between, I've made progress on Maggie's Farm and think I'll have something to show you very soon. It's seriously Adorable. (I could stitch it all over again!) Need a new project sketched and started up for Thursday's travel too. Plenty of ideas, just need to do it.